If the blogosphere is to be believed, and we have no reason to doubt it, there’s nothing a proper Homesteader enjoys more than the act of stowing away their harvest’s bounty. Be it preserving or canning, pickling or jamming, freezing, drying or brining it appears that the any urban farmer worth their salt can’t wait for that special moment when a harvest switches from ‘just enough for a taste’ to ‘if I have to eat another *insert appropriate fruit or vegetable I’ll scream’, so they can unearth the hugest pot from the back of the cupboard and get to work. How we wish it was like this for us. Don’t get us wrong, there’s nothing we enjoy more than a store cupboard packed full of our own home-grown preserves. Being able to jazz up that winter coleslaw with a couple of our own diced gherkins or smother our Sunday morning toast with jam from raspberries that grew not two metres from our own back door is a special kind of wonderful. We even enjoy the process of changing produce from fresh to stand-by once we get started. But that whole getting started thing: don’t tell anyone, but we find it a bit daunting; intimidating; in truth we find it downright scary! On unearthing this until recently unrecognised fear (prompted by frustration at our collective procrastination over braiding up the garlic yield) a bit of dinner table investigative discussion was indulged in. Why did the thought of preserving our glut scare us so? Presently, like the sun bursting through a persistent sea mist, we finally got it: preserving is taking something we’ve nurtured and tended and dreamed about and, on reaching its best possible palatability, mucking around with it. What if we get it wrong? What if the jam goes mouldy or the garlic rots? What if *shudder* the pickles aren’t crunchy? Then we rolled our eyes, sighed heavily at the ridiculousness of it, and got on with creating order out of the stockpiled garlic. Tomorrow we’re turning a bucket of plums into our favourite fish and chip condiment (yes, we know it sounds disgusting, but we challenge you to try it) and we’ve got some apricots to bottle as well. We won’t say we can’t wait to get started, but we’re on our way. 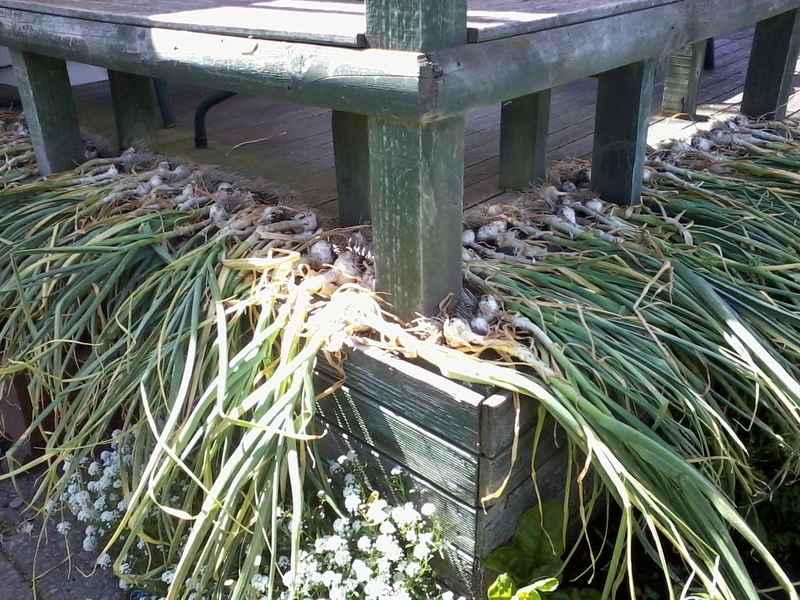 One form of procrastination we had utilised in favour of the garlic harvest was a bit of front garden pottering. Over the weekend we trimmed and weeded and faffed about until, come Sunday evening, we were pretty impressed with how things were looking. Yes, we know it’s only one of thousands posted in mailboxes throughout our fair city but we’re still buzzing that our ham-fisted, experimental, half-baked attempt at this gardening game made an a couple of influential gardening gurus stop, backtrack, and tell us we were doing okay. 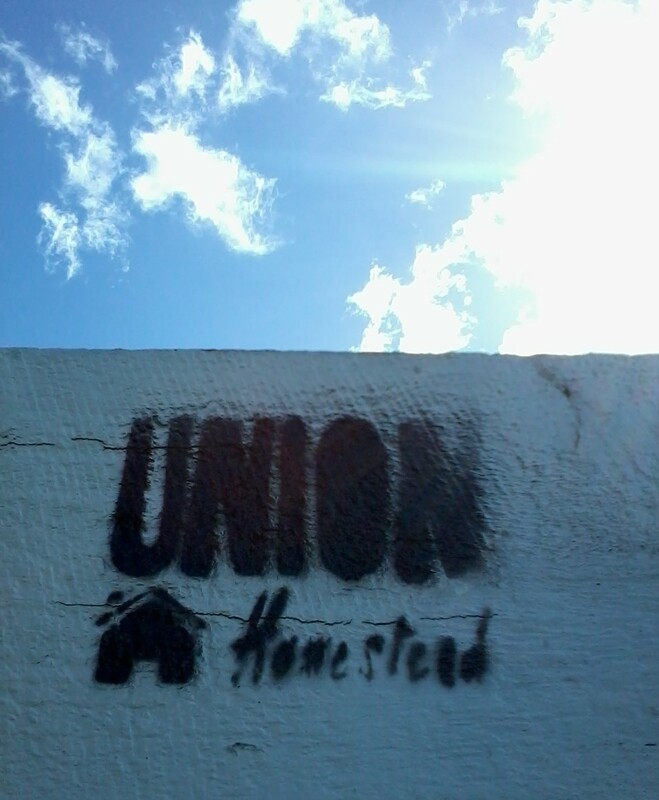 This entry was posted in Union Homestead and tagged allotment, Aotearoa, award, Christchurch, drying garlic, garden, gardening, garlic, garlic harvest, harvest, harvesting, Homestead, Homesteader, homesteading, micro farm, New Brighton, New Zealand, organic garden, organic gardening, Otautahi, pickling, preserving, procrastination, store cupboard, suburban farming, urban farm. Bookmark the permalink. Congratulations on justly earning a well deserved award and good luck in dealing with your homegrown produce. The plum sauce is bubbling gently as I type and I’m feeling much better about it all now I’ve started. Well earned I’d say!! That garden of yours just looks lovely. The garlic braids are a work of art …hang them the wall! When I had a big veggie garden in Canada, I was all to happy to pickle and jar and what not…until the end of two weeks of steaming pans in a sweltering kitchen, red eyes of vinegar and sick of smelling like an organic groceries store! Peace and serenity came only back when my pantry was tidy with gleaming rows of colorful jars and I smelled of ‘Twilight forest” again with proper mascara and eyeshadow back in place….hang in there! Now we’ve started, I’m feeling much more enthusiastic. Plum Sauce today, apricots tomorrow and then to tackle some of the karaka berries in the freezer…jam, I think. Well done. Some well judged praise is always welcome and rarely found. If the preserves go wrong, so what? Nothing is lost of there were too many to eat anyway. My trouble is making too much jam and then getting fat eating it all. Thanks for your kind words.You are right, of course, about having nothing to lose and I also fall into the trap of over-eating my excess jam although in my case it’s because I get bored with the run of the mill stuff and get all arty with my combination which everyone else refuses to touch. Last year it was pear and ginger: delicious but twelve jars are more than enough for one person. I am very conservative when it comes to putting things into jam other than the base fruit. I like ginger but not in combination with sweet things. 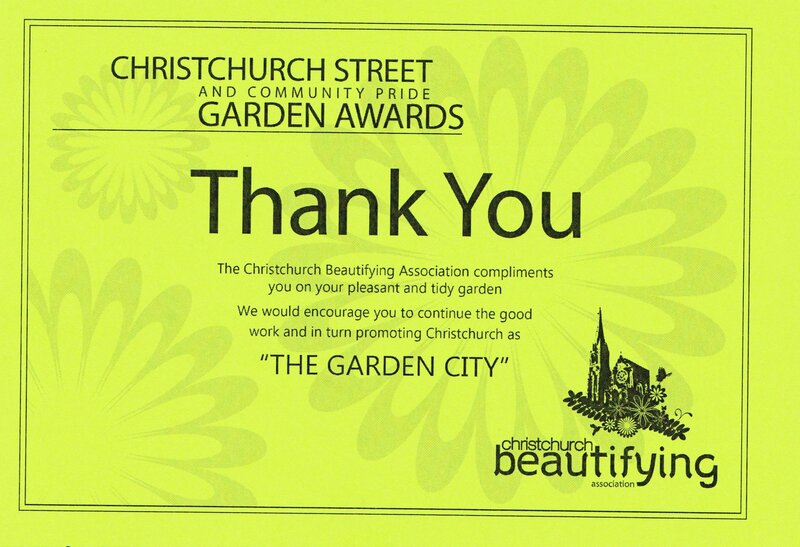 I love that the City of Christchurch does that with the certificates – a pat on the back is always welcome! And I must say well deserved, that front bit is really looking wonderful. And all that garlic! Wow! 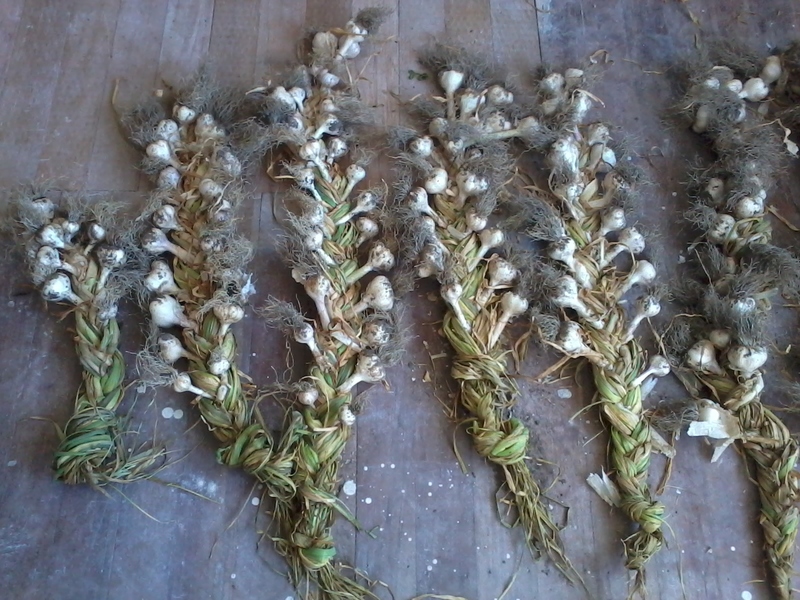 Don’t tell your helpers, but I don’t braid mine – after it’s cured, I cut all the leafy bit off, and throw all the bulbs in an onion sack and hang it up in the larder part of the basement. Your braids definitely look the thing though! Plum sauce – I made it for the first time this year thanks to an enormous crop and we love it with breaded chicken strips. Haven’t tried it with fish, but I should. It’s good with cheese too. The thing with hesitating about committing all that hard earned produce to the sketchy science of DIY food preservation is – my theory – it was so much work for such a small amount of produce, and if we blow it and it’s ruined, well then,,,.that’s me…the girls worry that I’m going to poison them… The reason I think this is the reason 🙂 is because when you have tons of something (plums for example) it’s way less daunting. 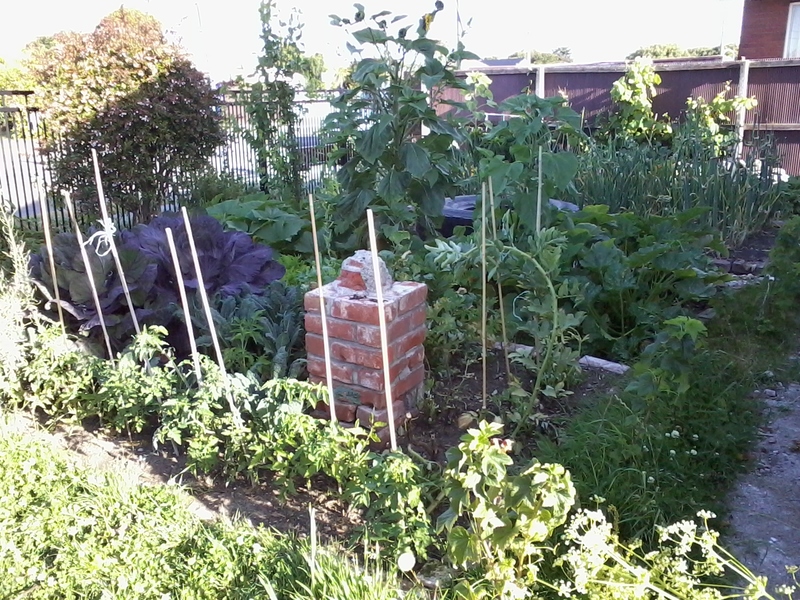 It should be more daunting because there’s so much – and perhaps someday I’ll get to that place (have you seen the blogs where people start to moan about too many tomatoes? ), but somehow, I’m not at that end of the pendulum swing yet, don’t know about you, though now that I think about it, that IS a lot of garlic. Too much garlic?! Is there such a thing? We have plans for roasting and storing some in olive oil and read the other day about someone who chops it up finely and dehydrates it. I may give that a go too.